Summary Wi-Fi "system" using multiple units connected via Wi-Fi mesh. Many of you have probably already read everyone else's coverage of eero's mesh Wi-Fi system by now. Some of the reviews contained gushing reports of miraculous cures of formerly troublesome Wi-Fi installations. Most others were at least complementary. I decided to take my time with eero, given its first-in-category status. Ms. SmallNetBuilder and I used it for a few weeks, replacing our standard setup of main router and one Ethernet-connected access point. I then put it through our standard wireless router test suite (or at least tried to) and even ran special multi-client and multi-hop tests. In the end, I can see how eero might have produced better results than some router / extender setups it temporarily replaced in other reviewers' testing. But eero is no miracle cure for all Wi-Fi woes by any stretch. But I get ahead of myself. 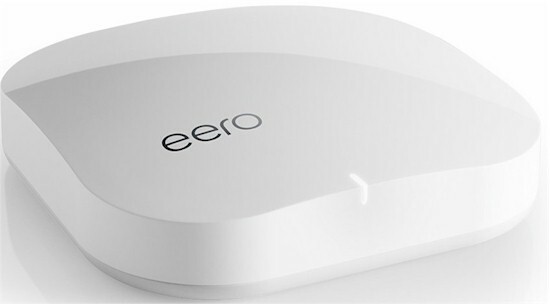 eero is an unassuming square glossy white box, with a 4.75" x 4.75" footprint and standing about an inch high. It's designed to sit on a table or shelf, so has no wall or ceiling mounting slots. There is only one LED on the front that glows white when it is set up and all is well, red when something's wrong and flashes blue during setup. The rear panel has a reset pinhole, power port, two Gigabit Ethernet ports and a USB 2.0 port that serves no purpose right now. The Ethernet ports are not designated WAN or LAN; eero automatically figures out what to do with each one depending on whether it is in router or bridge (AP) mode. eero currently costs $199 for one or $499 for a three-pack. The three-pack comes with three power supplies, but only one Ethernet cable. eero's FCC inside photos are under temporary non-disclosure for an indeterminate time. So after testing was complete, I opened up one of my three eeros. The photo below has all RF can tops and heatsinks removed and is annotated because eero has a few tricks under its little white plastic hood. As an early CNET article stated, eero is a Qualcomm / QCA based design. Inspection of its innards reveals it's a 2x2 AC1200 class router with a twist. Instead of dedicated 2.4 and 5 GHz radios, one radio serves up both 2.4 and 5 GHz high band (Ch 149 - 163). The other is dedicated to 5 GHz low band (Ch 36 - 48). You can see four straight-wire 5 GHz omni dipole antennas in the annotated photo below; two for each radio. Two bent-metal antennas serve the 2.4 GHz radio; the third is connected to the Atheros AR3012 Bluetooth 4.0 radio. eero uses a Qualcomm dual-core IPQ8062 processor @ 1 GHz. This puts it more on a footing with current Qualcomm-based AC2600 class routers using 1.4 GHz IPQ8064 processors than other AC1200 class routers. Both Qualcomm SoCs have two Krait 300 ARMv7-A compatible cores. eero's other components are collected into Table 1, along with two conventionally designed AC1200 class routers for comparison. The gallery below has more shots of eero's insides, with additional commentary. eero's only heatsink sits atop the RF can enclosing the Qualcomm IPQ8062 processor, RAM and flash. That can's top is epoxyied on tight. It took an hour of careful scraping to open it. The black piece affixed to the top is metal, most likely for RF control. Not much to see on the board bottom. Will all RF can tops removed, the RFMD amplifiers and RF front ends are visible. The 5 GHz filters are marked 5250B and 5825B. The Atheros AR3012 Bluetooth 4.0 radio is in the lower right RF can. Here's the annotated board view, to complete the series. Like Google's OnHub, eero is designed for people who don't want to know nuthin' about routers. So its feature set is, by design, as limited as possible to get eero connected to your ISP and your wireless (and wired) devices connected to the internet. I'm not going to walk through setting up eero. The eero video below is a bit cutesy, but describes the process pretty well. You can also read eero's setup FAQ if you want more detail and less cute. You will need an Android (4.4 and higher) smarthphone or iPhone (iOS 8 and higher) with an internet connection that also supports Bluetooth 4.0. Although eero's app will want to authenticate your account setup via text to your smartphone, you can change the number to one you know is untextable and eero will fall back and email the code to you. Note your account doesn't have a password. You login using your mobile phone number or email and authenticate with a texted or emailed code. Once your account is set up, installing an eero AP should go smoothly if your service provider doesn't require any authentication and just lets your modem grab its IP address information via DHCP. This eero FAQ has more information about services that will or won't work. The short story is, if your provider uses PPPoE, PPTP, L2TP or IPv6 only, you'll have to use eero in bridge (access point) mode. I initially let eero be my router, but quickly realized I depend on a lot of static IPs in my network. At the time of setup, eero's Android app did not support IP address reservations and I hadn't checked out the iOS app, which did. (eero has since updated the Android app so it also supports IP address reservations, which are required to forward ports.) So I switched eero to bridge mode and let my router go back to doing routing, but shut off its wireless so eero could handle Wi-Fi. Eero's app handles all configuration; there is no browser interface. If you try to hit an eero's IP address, your browser will just hang because there is no webserver running. In fact, using Fing on an Android tablet connected to eero to run a service scan returned only UPnP running on port 1900.
eero's app reminds me a lot of Google's On app for its OnHub routers in its simplicity. It's designed to get eero set up, provide some status information and configure a limited set of routing features. After you are set up, the app opens on the My network screen shown on the left in the composite image below. Tapping the hamburger reveals the main menu, shown on the right. Note that I used the iOS app running on a 5th generation iPod touch for the screenshots because it supports more functions. It was a smart move for eero to prominently feature a built-in speed test on the My network screen. While convenient, it only measures wired internet down and uplink throughput to the Ethernet-connected eero and nothing about Wi-Fi throughput. You can initiate a speed test manually by swiping down on the My network screen. This works on both iOS and Android apps. As shown below, the Number of devices currently on networks currently provides more information on iOS (right) than Android (left). Since eero recently enabled the port forwarding, IP reservation and DNS settings features that had been greyed out on the Android app, they'll probably also fix the connected devices screen at some point. I don't know why the Android app was flagging eero cloud connection problems because everything was working fine. I would frequently see this message and all would seem fine at the time. The last section of the My networks screen shows the eeros configured in your network. eero One is flagged as offline because I unplugged it. Note you can also add another eero from here. Neither the eero offline flag nor the add-an-eero functions are currently available on the Android app. Tapping an eero icon takes you to its Details screen, shown below. It's a long screen, so the image is a composite. You can check each eero's firmware revision here, but there is no way to force an update. eero's cloud automatically takes care of that and doesn't bother letting you know when the firmware revision changes. During the time I've been working with eero, eero OS went from v1.0.0 to v1.0.5 and to v1.0.6 as I write this up. As I did with OnHub, I've taken a list of typical AC1200 class router features and edited it to show what eero supports. The takeaway is eero and OnHub features are similar, but with OnHub providing more information about device bandwidth use and the ability to temporarily designate a device to receive priority access to bandwidth. Port forwarding for single or multiple ports with TCP, UDP or both forwarded. Enable/disable for each entry. The gallery below has screenshots with commentary of most of the eero app screens. Tapping on an eero icon on My Network screen shows this screen. You can change an eero name (location) here. This helpful screen contains BSSID info that can help you figure out where devices are connected. Network name is the SSID for both bands. Password is the WPA2 key. These are the only wireless features you can control. These are the only router functions you can control. You can change the DNS servers used here. You can change the subnet your LAN uses here. eero defaults to 192.168.7.x. UPnP is enabled by default. These screens show port forwarding. You select a device, create an IP reservation for it, then open a port. You can specify external and internal ports separately, and forward both TCP & UDP or TCP or UDP (not shown) only. Forwarding port ranges is not possible & there is no DMZ feature. You can provide guest access to your LAN and internet ('main network') or an internet-only guest network, Both options send the network name and password in clear text for the recipient to manually enter on their device. Wow. An actual phone number right in the app. Your account has a name, but no password. You authenticate login via an emailed or texted code. Routing throughput was measured using our standard router test process with the router using v1.0.5 firmware. Table 2 summarizes the results and includes the #2 ranked Linksys EA6350 and Netis WF2780 for comparison. As previously noted, I could not open ports for IxChariot to run its WAN to LAN test, so have only LAN to WAN results to report. The IxChariot unidirectional composite plot shows a familiar throughput pattern for this test, alternating between maximum throughput around 950 Mbps and a lower baseline, around 780 Mbps in this case. I would expect WAN to LAN throughput to be similar, but have no data to back that expectation. The pain many Wi-Fi users feel is from everyone in their household trying to watch streaming video at the same time. Success depends on the services you're using, the protocols and stream rates they use, how big your internet pipe is and, yes, the robustness of your Wi-Fi network. I first considered using streaming video to load up eero. But the thought of trying to watch all those screens for signs of buffering or pixelation made me rethink that approach. Instead, I turned to IxChariot and used UDP streaming. While I wouldn't have anything to watch, this method would keep track of lost packets. It's been almost 10 years (yikes!) since I last looked at the relationship of packet loss to video quality. But this study showed, depending on encoding method, 1% of UDP packet loss would make video unwatchable and small problems may be seen with as little as 0.05% packet loss! Even though most internet-based video streaming no longer uses UDP, it's still the best way to detect transmission packet loss. So when you are trying to gauge a network's bandwidth capacity, UDP is still the best protocol to use. The mix of eight dual-band N and AC class devices in Table 3 was assembled for this test. An IxChariot script was configured using the IPTV video portion script (IPTVv.scr) and UDP. The only thing changed was the send data rate from its default of 1.451 Mbps. All eight devices received this same stream for 2 minutes. All devices could connect to either band. They connected as shown in Table 4 and stayed this way from run to run. No other networks were in range for this test. For the baseline test, one eero ("Root") was set up in an adjacent Utility room with a sheetrock wall between it and all the devices sitting on a wire-frame rack approximately 13 feet away. Packet loss for each device is shown in the IxChariot plot below. Only the iPod Touch, Lenovo x220i and iPad lost packets, with the Lenovo having the highest data loss of almost 1.5%, which should have rendered the video unwatchable. Please read iPad2 as iPad Air in all the plots; I incorrectly identified it at test time. Increasing the stream rate to 10 Mbps significantly increased the Lenovo's error rate to 12%. The two Apple devices had no errors in this test. I decided to move the Root eero to the same room as the devices (Back Lab) and rerun the test, this time for 5 minutes. Once the eero was powered back up, I again noted where devices connected and found only the Moto X smartphone had moved from channel 36 to 1. This small change seemed to have an unusually large effect on error rate with multiple devices losing over 10% of streamed data. Without changing anything, I reran the test about 20 minutes later and found performance had improved significantly. Although the plot below shows all devices having some packet loss, only the problem child Lenovo x220i had data loss over 1%. Although I can't say I pushed eero to its limit, my conclusion for these tests is that the single eero handled itself pretty well. It moved an aggregate capacity of 80 Mbps spread across a mix of eight devices with potentially noticeable data loss on only one or two devices. If TCP/IP, HLS or another protocol that ensures packet delivery were used, I doubt problems would be seen in any of the video streams. eero's key claim to fame is its wireless mesh connected multi access point architecture. So this next set of tests set out to explore the throughput a few different eero configurations would yield. Since I was looking at throughput for a single device, I went back to my old standby, IxChariot's TCP/IP throughput script. The test client was a Lenovo T450s notebook with a built-in Intel Wireless AC 7265 2x2 wireless adapter. I tested four configurations shown in the floor plan diagrams below, with the test client connected using zero to two wireless "hops". The three eeros were creatively named "Root, "One" and "Two". The IxChariot plot below combines the downlink results for the four runs. What's interesting here is that the one-hop "root-one" throughput is pretty close to the two-hop root-one-two_butler test. I'm not sure whether it makes a difference, but note the test laptop connected via 5 GHz for both these tests. Also note the "Two" eero was located pretty much right above the "One" eero for the root-one-two_butler test. The root-one-two_master test shows the importance of getting your eeros placed correctly. Everything else in this test is the same; only the location of the "Two" eero changed. The uplink plot shows a very different story. Throughput for three of the four tests is highly variable and at best only half the 179 Mbps obtained in the best-case zero-hop downlink root test. Mesh wireless is attractive to home users for the same reason wireless extenders have been flying off store shelves; no cabling required. So why should you pay $400 for two eeros with a very limited routing feature set, when you can buy the top-ranked AC1200 class TP-LINK Archer C5 router for around $80 and the top-ranked NETGEAR EX6150 AC1200 extender for around $100? The answer boils down to ease of use and reliability. While wireless extender setup has become a lot easier, it still requires judgement by the installer, who has only fairly crude tools to help her. The other problem with extenders is that the only "tools" provided to monitor network performance post-installation are user complaints and confusion on which SSID to connect to. Although backhaul management is provided in some newer extenders, it's fairly crude and will only improve if and when new firmware is available and installed. In contrast, eero is designed as a multi-AP system that has had much effort put into learning how to manage backhaul traffic, plus a purpose-built dual-band radio designed to complement those algorithms. Since the system intelligence primarily lives in eero's cloud, it has access to more computing power than economically feasible to put into a consumer unit and its algorithms can be constantly tweaked as the system learns. Of course, this cloud dependence is also eero's greatest weakness, since an eero APs essentially turns into a glossy white objet d'art, should eero go belly-up or be acquired. Although some folks think router hacking and tweaking is their idea of a good time, most of us just want our Wi-Fi to work. And we've shown we are willing to throw more and more money at achieving this result. You may think it's crazy to pay $500 in hope of getting better Wi-Fi, but that's what some folks were doing this past holiday season when ASUS RT-AC5300s were in short supply. And while those days seem behind us, price trackers still show RT-AC5300 ASPs around $375. Given my albeit limited previous experience with business-grade Meraki mesh wireless, I was prepared to not be impressed by eero. But I am. Yes, it's twice as expensive as it needs to be, but that's just a matter of eero seizing an opportunity while it can. With AC1200 class routers now down around $100, I'm sure eero has room to move on price. If they got a three-pack down to $300 - $350 and a single to $125, eero could sell a lot more and secure its place as a mesh-wireless market leader. And they'll want to do that before Luma ships its mesh solution later this "spring" and D-Link starts shipping its "DKT-891 Unified Home Networking Kit" based on Qualcomm's Wi-Fi SON technology in around the same timeframe. Both will appeal to the informed Wi-Fi buyer who is already sold on the multi-AP approach and both have more routing and security features to offer than eero currently does. Price aside, eero is not going to be for everyone. If you have used your current' router's administration interface for anything other than setup, you probably won't be able to deal with eero's very basic feature set. You'll also want to place the Ethernet-connected eero between the other two, to minimize the number of throughput-sapping hops your devices see. And if you don't have many dual-band devices, they'll compete for 2.4 GHz bandwidth that eero could otherwise use for backhaul. Just as every auto maker is hard at work at producing vehicles that can drive themselves or at least take over more mundane driving tasks, consumer router makers do realize the days of the big honkin' router are coming to a close. Sure, they'll keep making them, as long as uninformed consumers keep buying them. However at some point folks are going to get wise to the fact that to get fast, reliable Wi-Fi you need multiple access points and the smarts to make them work smoothly together. Quite frankly, most of us don't have those smarts, but there are folks who do. The trick is to let those folks do the Wi-Fi driving. eero is worth taking for a spin.